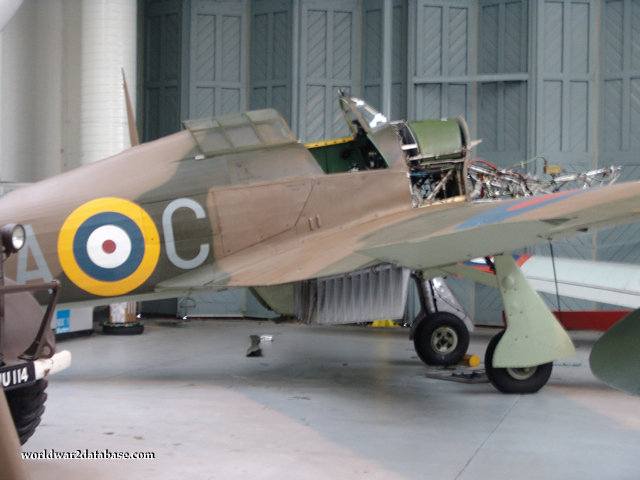 Hawker Hurricane Mark XIIa serial number 5711 was built in 1942 by Canadian Car Foundry and joined the Royal Canadian Air Force in 1943. It served with 123, 127 and 129 RCAF squadrons in a training role. It carried the incredible, if not formidable, armament of twelve .303 machine guns. This Hurricane flew over Malta in 2005, the first time a "Hurry" flew there since World War II. 5711 is now painted as Z5140, a Hurricane Mark IIb which flew off HMS Ark Royal on June 6, 1941 to Valetta to participate in RAF 126 squadron's defense of the island. Here you see it undergoing maintenance, with its engine dismounted.